SPACEPORT NEWSOctober 24, 1997 Page 4 Nine NASA and contractor employees of Kennedy Space Center were honored this year with the Quality Assurance Special Achievement (QASAR) award for exemplary performance in contributing quality products and/or services to the space program. The QASAR is sponsored by NASA Headquarters Office of Safety and Mission Assurance. The director of KSCs Safety and Mission Assurance Directorate makes the final selection of QASAR recipients at the space center. The honorees were: Richard Carlson, Rocketdyne: For expert systems knowledge of Space Shuttle Main Engine (SSME) hardware/software as it related to flight safety. Carlson noticed several SSME main fuel valve actuators had less closing bias than the rest of the fleet. He was instrumental in getting a special software change approved to increase the closing bias. Clark Creery, Boeing: For outstanding guidance in the planning and implementation of the International Organization of Standards (ISO) 9000 for McDonnell Douglas Space and Defense Systems at KSC. Creery played a vital role in developing the framework to implement ISO at KSC. Patrice Henson, USA: For expertly leading a proactive ISO 9000 Assessment Team at the TPSF, demonstrating exceptional performance in leadership, challenging her peers to achieve high levels of performance, and most of all, assuring success in achieving ISO 9000 certification. James Keller, I-NET: For expertise in identifying several operational hazards in the form of non-compliance at KSC and OSHA Fall Protection Regulations on the 600-Ton Proof Load Test Fixture in the LETF. Keller provided outstanding leadership in resolving the problems through consultation and agreements with a member of the National Safety Council, a Florida Division of Safety engineer, KSC safety engineers and NASA design engineers. James Davis, NASA: For demonstrating excellence and commitment to the safety of the vehicle and flight crew. During surveillance activities on the right-hand Orbiter Maneuvering System (OMS) Pod carrier panels, Davis discovered two Felt Reusable Surface Insulation (FRSI) plugs were missing. He initiated corrective action, avoiding possible severe damage to the vehicle. David Law, USA: For keen observation techniques and technical expertise as a technician assigned to operations at the Pad. During closeout activities for STS-82/ OV-103, and prior to flight crews arrival, Law noticed that the orbiter cabin pressure probe was misconfigured. He identified the problem, documented it and reconfigured the probe per print. If not found prior to crew arrival, this could have resulted in a launch delay. Timothy Wright, USA: For demonstrating exceptional performance during critical inspection and rework of STS80 hatch latch actuators. After several attempts to rework theQASAR awards go to nine space center employees October employees of the monthHONORED in October were (from left): Thomas Hoffman, Shuttle Processing; Rita DalSanto, Space Station Hardware Integration; Ivory Webb, Chief Financial Officers Office; Donald McMahon, Safety and Mission Assurance; Anita Nesbit, Procurement Office; Chau Le, Checkout and Launch Control System; Janice Everett, Biomedical Operations; and Robert Dorian, Payload Carriers Program Office. Not shown are Marion Thompson, Payload Processing; Paul Schwindt, Engineering Development; Saul Barton, Administration Office; and William Franklin, Logistics Operations.rotors and stators of one of the actuators that failed the noback acceptance test associated with the clutch assembly, Wright traveled to the equipment manufacturer in lieu of Christmas vacation. Corrective action reinstated the quality, integrity, and reliability of the actuators for every orbiter in the fleet and one intended for Space Station. J. Mica Parenti, NASA, and Gary Hendrickson, Boeing: For outstanding demonstration of teamwork in the development and implementation of improvements and implementation of improvements to the MRB and WAD processes. Jointly, they developed a WAD and MRB metric database that allows one to review, track, verify, and report technical and documentation errors in the WAD and MRB processes. The metrics will be used by the contractor to improve these processes and by NASA to monitor conformance to procedures. These QASAR honorees are also eligible for an agencywide recognition later this month. Making wavesFIFTY years ago on Oct. 14, 1947, Chuck Yeager broke the sound barrier in the Bell Aircraft Corp. X-1-1 aircraft. This photo from the Dryden Flight Research Center archives shows that historic flight. Yeager flew the aircraft to a speed of about 670 miles per hour, or Mach 1.015, at an altitude of 42,000 feet. The shock waves show in the exhaust plume.The X-1 was just 31 feet long and 10 feet high, with a wing span of 29 feet. It weighed less than 5,000 pounds and did not have an ejection seat. Yeager ignited the aircrafts XLR-11 rocket engines after being air-launched from under the bomb bay of a B-29 at 21,000 feet. Yeager also was the pilot when the X-1 reached its maximum speed of about 950 miles per hour. Another U.S. Air Force pilot, Frank Everest Jr., was credited with taking the X-1 to its maximum altitude of 71,900 feet. The X-1 was part of the Research Airplane Program, a joint civilian-military effort conceived near the end of World War II. SPACEPORT NEWS October 24, 1997 Page 5 SPACE FLIGHT AWARENESS (SFA) AWARD goes to the Environmental Programs and Hazardous Waste Management Team, shown here with Shuttle Processing Director Bob Sieck and Acting Chief of the Environmental Program Office Burt Summerfield (standing, second from right and right, respectively). HYPERGOLIC SYSTEMS Payload Reactants and Storage Distribution (PRSD) Team outside Launch Pad 39B with Deputy Director for Business Operations Jim Jennings (sixth from right) after receiving the KSC Foreign Object Debris (FOD) Prevention Board Team Award for the 1997 third quarter. Headed by Don Wellman of United Space Alliance, the contractor team was praised for their continued efforts to prevent FOD and FOD-related incidents. Also recognized were their hurricane preparedness activities and preparation for SCAPE operations. The team was presented with a $150 check, a plaque and individual certifcates of achievement.USA team earns FOD prevention award Aggressive measures yield results and SFA honor for six-member team Two from KSC in 1996-97 PDP classTwo KSC NASA employees, Jose Nuez and Walt Feitshans, are members of the graduating 1996-97 Professional Development Program (PDP) class. This program provides competively-selected NASA professionals with assignments of about four to 12 months duration at a different center or organization. The goal of the program is to provide a broader perspective of the agency and the impact of NASA programs upon developing technology. In his remarks to the 15member class, NASA Administrator Dan Goldin challenged them to have a vision, take risks and push the envelope. This approach will ensure that the agency continues to lead the world in space exploration, Goldin told the students. Class spokesperson Nuez, from KSC, echoed Goldins challenge, calling his classmates the explorers, pioneers and innovators who will make a positive difference in every Americans life.NASA Administrator Dan Goldin (left) poses with PDP graduates Walt Feitshans and Jose Nuez from KSC.The six-member United Space Alliance Environmental Programs and Hazardous Waste Team has achieved impressive results over the past four years to reduce hazardous waste production at KSC. The aggressive and innovative measures which they have developed have led to substantial cost-savings while also preserving a clean and pollution-free environment at the space center. Among the teams achievements are: Hydraulic oil reuse: The in-place cleaning of hydraulic oil has increased the life of components since the cleaned oil is actually cleaner than new oil. Cost avoidance: $3,000 per year. Antifreeze reuse: Antifreeze, used as a coolan,t is now being reused for all rolling stock. Cost avoidance: $4,000 per year. Chlorofluorocarbon (CFC) reduction: CFC used for refrigeration has been reduced by 88 per cent over the last three years, primarily due to replacements with approved alternates. Solventuse reduction has been achieved through aqueous cleaning and today saves about $8,000 per year, with more savings to be provided as systems receive more use. Waste segregation: The contamination of nonhazardous solid waste with hazardous waste accounts for the majority of hazardous waste. For example, 4,000 pounds of hazardous waste ended up as 400,000 pounds of material because of contamination. By limiting contamination, an 80 percent reduction in some processes and an overall reduction of 12 percent in the amount of waste generated were achieved. Cost avoidance: $400,000 per year. Solvent wiper reuse: In 1991, Shuttle processing operations produced 94,025 gallons of manifested hazardous waste, of which contaminated wiper material accounted for about 21 percent. A reuse program was implemented which has reduced the waste stream by 99 percent. Cost avoidance: $315,000 per year. Aerosal can recycling : A 100 percent reduction of this waste stream has been achieved. This waste stream accounted for 1.5 percent of hazardous waste in 1992. Under a program developed by the team, material remaining in aerosal cans is used and the empty cans recycled. Cost avoidance: $15,000 per year. SPACEPORT NEWSOctober 24, 1997 Page 6 Three-time Shuttle veteran Kenneth D. Cockrell has assumed the role of Chief of the Astronaut Office, replacing Robert D. Cabana (Col., USMC). Cabana, who served as Chief Astronaut since mid1994, is training for Shuttle mission STS-88, the first United States assembly flight to build the International Space Station. STS-88 isSTAR LIGHT One of the intrinsically brightest stars in our galaxy appears as the bright white dot in the center of this image taken with NASA's Hubble Space Telescope. Hubble's Near Infrared Camera and Multi-Object Spectrometer (NICMOS) was needed to take the picture because the star is hidden at the galactic center behind obscuring dust. NICMOS' infrared vision penetrated the dust to reveal the star, which is glowing with the radiance of 10 million suns.The image also shows one of the most massive stellar eruptions ever seen in space. The radiant star has enough raw power to blow off two expanding shells (magenta) of gas equal to the mass of several of our suns.The largest shell is so big (4 light-years) it would stretch nearly all the way from our Sun to the next nearest star.Despite such a tremendous mass loss, astronomers estimate this extraordinary star may presently be 100 times more massive than our Sun, and may have started with as much as 200 solar masses of material. The star is 25,000 light-years away. Hubble unveils brightest star Cockrell named chief astronautCOCKRELL most recently flew as commander of STS-80 in 1996.Special brand of courage drives KSC workerNicole Fromberg knows what its like to be an outsider. You would never think it by looking at her. Poised and attractive, she looks every inch the successful professional at work in her second floor office in the Headquarters Building. You might wonder from her accent if she is hearingimpaired, but she is so fluent that the thought is easily dismissed. This ease is the result of a hard-worn battle that began when she was born deaf. Fromberg, now 31 years old, was taught by her mother to speak when she was just a little girl. She practiced every day and instead of being sent to special schools attended public schools with nonhearing impaired kids. Mainstreamed, she calls it. Using a hearing aid, she always sat near the front of the class so she could pick up the lessons being taught. Shy by nature, the result was disastrous. I had no friends, she recalls, and spent the years from kindergarten through high school in a prison of solitude. Liberation from this lonely world of isolation came in the college years, when she attended two different colleges for the deaf, including Gallaudet University in Washington, D.C. She learned signing for the first time in her life and discovered a new way to communicate. More important, she found a peer group that understood the world in which she lived. Fromberg recalls fondly being at Gallaudet when students protested the appointment of a non-deaf president, unrelenting in their objections until the decision was finally overturned. She participated in the demonstrations and called the non-violent protests a wonderful experience. Today, Fromberg is an accountant in the NASA KSC Chief Financial Officers Office. She worked at Goddard Space Flight Center in Greenbelt, Md., before moving to Florida three years ago. She notes that at Goddard there was a group of six to seven deaf workers with whom she was friends; there is only about half that number here. While Frombergs ability to discern speech and her own voice is so accomplished that she easily blends into the world of the hearing, she speaks wistfully of those kindred spirits in Maryland. Some life-altering experiences can only be understood by those who have undergone the same thing. For Fromberg, the early years of loneliness forged a strength in her that she would not exchange for anything. She does not regard being deaf as a disability, but as a source of scheduled for a July 1998 launch. Cockrell has flown in space three times, on STS-56 in 1993, STS-69 in 1995 and STS-80 in 1996. inner strength and commitment. About to marry a person who is non-deaf but communicates easily in sign language, she hopes to have a family. Gallaudet paid tribute to Frombergs accomplishments recently when it asked her to return to the school in February to speak to the students about professional development and succeeding in a hearing world. For Fromberg, this chance to give something back to the institution which gave her so much means everything. I cant wait, she says.TRUE GRIT The challenge of growing up deaf in a hearing world instilled inspired Nicole Fromberg rather than defeated her. Today she is a financial accountant for NASA. SPACEPORT NEWS October 24, 1997 Page 7 KSC NASA honorees enjoyed their visit to Mission Control at Johnson Space Center. From left are Calleen Coiner, Peter Chitko, Rayelle, Thomas, Timothy OBrien, Bobbi Gnan, Bill Larson and Valarie Franklin. Not shown: Penny Myers and Robyn Wesley. TO COMMEMORATE Native American Heritage month in November, the KSC Native American Intertribal Council (NAIC) is sponsoring a non-competitive Pow Wow on Monday, Nov. 3, from 11 a.m. to 3 p.m. in the Rocket Garden at the KSC Visitor Center Complex. The Pow Wow Opening Ceremony will be at 11 a.m., followed by non-competitive dancing, storytelling, and exhibitions of Native American crafts. Featured will be Master of Ceremony Thomas Chibitty and Eagle Claw Southern Drum. Visitors are encouraged to bring folding chairs or blankets, and to participate in the activities as this photo from last years event shows, children will enjoy the Pow Wow. KSC employees may attend, with supervisory approval. Native American food will be available for those who purchase meal tickets. There is no charge to attend. For additional information, please contact Martha Passaro, 867-7580 or Jean Rhodes, 867-2307.KSC NASA and contractor employees recently received Space Flight Awareness program recognition. Ten employees were presented with Silver Snoopy awards: Loraine Schafer, Tony Killiri, Tom Draus and John Stealey, NASA; Cheri McLean, Boeing; Hank Ramirez, Sherikon; Debra Thornton, EG^G; and Joe Barretta, Brad Lawrence and Terry Mayfield, United Space Alliance. Forty-eight KSC workers were treated to a round of special events in their honor as SFA award recipients. The Honoree Award is the highest form of recognition bestowed upon an employee by the NASA Space Flight Awareness Program. Nine civil service employees were honored: Peter Chitko, Calleen Coiner, Valarie Franklin, Roberta Gnan, William Larson, Penny Myers, Timothy OBrien, Rayelle Thomas and Robyn Wesley. Contractor employees honored were Lisa Leger and Kelly Norwood, The BioneticsNative American Heritage MonthCorp. ; Timothy Lorenz, Boeing Space Systems, Rocketdyne; Albert Fazio and Robert Van Sickle, Boeing Space Systems; and Patricia Bennett, Jon Gleman, Harris Graeber II, Kilby Holt and Connie McFadden, Boeing KSC. Also, Caroline Zaffery, INET Inc.; Anthony Corak, Joel Dyson and Joel Thilburg, United Technologies, USBI Co.; Anne Ball, Advanced Aerospace Materials Corp.; Robert Palka, Furon Co.; and Donald Ackerman Jr., Maxine Daniels, James Johnson, David Kolb, James Lesky, William Nichols, Dawn Patton and Diane Smith, EG&G Florida. United Space Alliance employees receiving honors were: Ashleigh Beatrice, Jimmie Creagle, Daniel Dowling, Audrey Grayson, James Hardman, Jeannette Harrell, Stephen Hunter, Paul Krause, Laura Ledford, Richard Morgan, Donald Pataky, Norman Peters, Jonathan Phillips, Keith Ray and David Zwick.NASA honors KSC employees Nov. 5 is Bone Marrow Registration Drive day at KSC. Sign up at any of the following locations: KSC Training Auditorium, 8 a.m. 5 p.m.; Cape Canaveral Area Clinic, 8 a.m. 5 p.m.; Launch Complex 39 Clinic, 8 a.m. 8 p.m.; NASA Shuttle Logistics Depot Health and Wellness Center, 8 a.m. 6 p.m.CFC halfway toward dollar goalAt press time, the KSC Combined Federal Campaign had achieved half its dollar goal in pledges. As of Oct. 17, a little more than $109,000 had been pledged toward a $200,000 goal. Directorate participation was varied, with some organizations reporting 100 percent participation and at least one yet to report any pledges. In the letter included with the CFC booklet, Center Director Roy Bridges Jr. makes an important point to bear in mind when considering whether to pledge to CFC. As government employees, he writes, our mission is to serve others, and this campaign allows us to fulfill that mission. In todays environment of government cutbacks, taking care of each other and the community is even more important and challenging. Good food, good companyHISPANIC Heritage Month luncheon (from left) KSC Director Roy Bridges Jr., NASA Associate Administrator for Equal Opportunity Programs George Reese and Deputy Director for Business Operations Jim Jennings were among the many attendees of the Oct. 7 luncheon held at the KSC Visitor Complex. Bridges was the keynote speaker. Plaques were presented to KSC NASA employees Ken Aguilar and Eduardo Lopez del Castillo for their contributions over the past two years to the KSC Hispanic Employment Working Group. John F. Kennedy Space Center Managing editor. . . . . . . . . . . . . . . . . Bruce Buckingham Editor. . . . . . . . . . . . . . . . . . . . . .. . .Paula Shawa Editorial support provided by Sherikon Space Systems Inc. Writers Group. Photographic support primarily provided by The Bionetics Corp. and Public Affairs Photographer George Shelton, also of Bionetics. 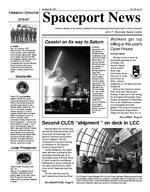 USGPO: 532-112/20058Spaceport News The Spaceport News is an official publication of the Kennedy Space Center and is published on alternate Fridays by the Public Affairs Office in the interest of KSC civil service and contractor employees. Contributions are welcome and should be submitted two weeks before publication to the Media Services Branch, AB-A. E-mail submissions can be sent to Paula.Shawa-1@ksc.nasa.gov SPACEPORT NEWSOctober 24, 1997 Page 8 to 2:30 p.m., with facilities closing at 3 p.m. Among the scheduled highlights is a drive-by of Launch Pad 39B, where the Space Shuttle Columbia will be awaiting liftoff on Nov. 19 for STS-87. Other Open House highlights include: Launch Complex 39 In addition to the Pad 39B drive-by, attendees may visit the Shuttle Landing Facility and walk inside a Shuttle Carrier Aircraft. At the Launch Control Center, guests may visit two Space Shuttle firing rooms and interact with a variety of exhibits. The Thermal Protection System Facility will be open, and guests may also peek inside the Vehicle Assembly Building. Visit a display of firefighting and rescue equipment at Fire Station 2, and then take a look at various transporters, including a Crawler-Transporter. At the Solid Rocket Booster Assembly and Refurbishment Facility (ARF) and the Logistics Facility, self-guided tours can be conducted. At Orbiter Processing Facility (OPF) Bay 2, Discovery will be available for viewing from the ground floor. Exhibits of Shuttle flight hardware and materials will be located between OPF Bays 1 and 2. Also look for displays of the Thermal Protection System (TPS) tile and orbiter processing. Industrial Area The Engineering Development (DE) Model Room in the Headquarters Building will be open, and at the Space Station Processing Facility and Operations and Checkout Building, various payloads will be on view. Briefings by astronauts and NASA officials will be given at 10 and 11 a.m. and noon and 1 p.m. in the Training Auditorium. In the Operations and Checkout Building, scheduled to be on view in the high bay are processing of the Neurolab Module and disassembly of the Astro-2 and the Tethered Satellite System payloads. The Payload Communications Center and Payload Control rooms will offer live television and panoramic views of the high bay. The first U.S. element of the International Space Station, Node-1, will be on display in the high bay of the Space Station Processing Facility, along with two Pressurized Mating Adapters. An exhibit of currently used test and development equipment will be on view in the Launch Equipment Test Facility. Several automation and robotics projects being developed to improve Shuttle ground processing operations will be exhibited in the Advanced Systems Laboratory; and in the Intelligent Systems Lab, several advanced software projects that make Shuttle processing more efficient will be demonstrated. Visitors may view videos and displays in the Parachute Refurbishment Facility, and assorted exhibits on ground support equipment and advanced technology will be displayed and demonstrated in the Engineering Development Laboratory. Cape Canaveral Air Station (CCAS) Areas to be open include the Bioastronautics Operation and Support Unit (in the Cape Dispensary Building), featuring the Geographic Information System/Remote Sensing Laboratory and state-of-theart chemistry and microbiology laboratories used to support the KSC ecological and life sciences activities. Exhibits at Hangar L, the Life Sciences Support Facility, include Shuttle middeck flight hardware and elements of a bioregenerative life support system. The disassembly and refurbishment operations on the east side of the Solid Rocket Booster Disassembly Facility and the south side of the hangars first and second floors will be open. Visitors can view displays and videos in the open bay area of the hangar, then walk toward the dock, where a retrieval ship will be open for a walk-through tour. The KSC Visitor Complex will offer a free IMAX show, Mission to Mir at 3:20 and 4:10 p.m. for badged employees and their guests. Employees who show their badge on Open House day will receive a 25 percent discount on souvenirs purchased in the Space Shop, too. In addition, the Merritt Island Launch Area (MILA) Spaceflight Tracking and Data Network Station, the Center for Space Education, the Air Force Space Museum, and the Merritt Island National Wildlife Refuge will be open during Open House. As part of KSCs Open House activities, the NASA Exchange will offer a free Open House commemorative medallion and Space Shuttle information card. Visit any of the NASA Exchange locations to receive your medallion and card; no purchase is necessary. The medallions and cards are limited, so one medallion and one card will be given per person, while quantities last. Every employee will receive a special Open House brochure /map about a week before the event. The booklet provides an overview of the space center, details the tour highlights, and features maps showing routes around KSC and CCAS. And you can check it all out in advance on the Web at http://www.ksc.nasa.gov/ events/1997/openhouse/ Other sources of information will be updates in KSC Countdown the KSC Bulletin and an update flyer, if neededOpen ...(Continued from Page 1) VISITORS lined up to see the displays inside Orbiter Processing Facility Bay 1 during the 1996 Community Appreciation Day which was open to the general public.